If you are an avid Lightroom user, you’re probably aware of how much it simplifies workflow. But, are you using it to reduce the time it takes for your group edits? Did you know that you can use Lightroom to apply Presets across a group of photos simultaneously? If you aren't using this unique feature, then you’re not optimizing Lightroom to your advantage. With particular Lightroom tools, you can process photos in batches while improving your workflow time. There is no need to process photos one at a time! You can even make minor adjustments after applying Lightroom Presets across a batch of images. One of Lightroom’s most attractive features is its Presets. Rather than manually editing pictures one at a time, a Preset will allow you to save adjustments or edits you frequently use to be easily repeated. Presets mean that you can apply your saved adjustments to future images without repeating the same edits over and over manually. By keeping your favorite or most frequently used adjustments as a Lightroom Preset, you save a lot of time and won’t have to apply the same edits repeatedly manually. But saving time in Lightroom does not stop there! 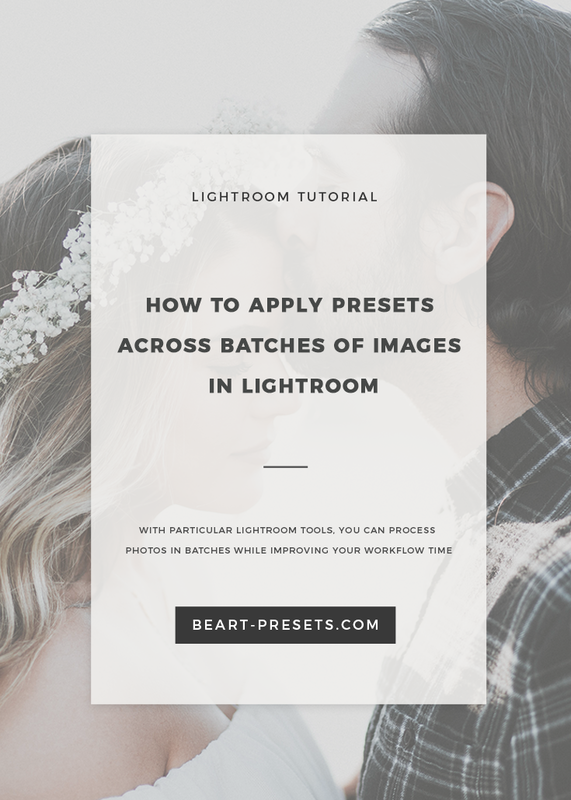 With a few steps, you can simultaneously use Lightroom Presets across an entire batch of images rather than one image at a time. 1. Apply Preset While Importing. - When you’re ready to do the import, make sure you are in Library Module. - Look for the box “apply during import” found in the import dialog. - Select the Preset you would like to apply to your images and then go ahead and click to import the photographs. You will notice that the Preset has been executed across your entire batch of photos! You just saved yourself from having to apply a Preset individually to each photo. 2. Presets while in Library Module. When photos are more dissimilar than they are similar, you can still apply Presets to a group of images. You will need to be in Library Module to do it. - In your batch of pictures, hold the Control button while simultaneously clicking on all of the images to which you want to apply that Preset. It can be one picture or many. - Then under the “Saved Preset” click on the drop-down menu in the Quick Develop panel. Choose the Preset you would like to apply to the photos you have selected. Your Preset will be applied across all of the photos you have chosen. You can continue this process for each group of photos. 3. Editing in Library Module. You can do more than applying Presets while in Library Module. You can also make other adjustments such as exposure, white balance, etc. You can do it to batches of pictures all at once saving you a lot of time. - Select a group of photographs. - Look in the Quick Develop panel and click the options you’d like to apply to your selected images simultaneously to change or edit them. - If you’d like to get a closer look at your photos, just click on the plus or minus keys to minimize or enlarge the view within the library. Once you have applied your broad edits or adjustments, you might want to do some fine tuning of the pictures. To do that, you’ll need to be in the Develop Module. - To make adjustments to multiple photos simultaneously, you will need to select the photos (CTRL + click) in the Library grid view or Develop Filmstrip. - Sync the photos by clicking on the sync button in the bottom of the right-hand panel. - Select the options you would like to apply. It will then sync across your selected photos. Always be especially careful when choosing your images so that you don’t inadvertently make changes to images you did not want to change! Voila! These techniques are how you can easily apply Lightroom Presets across batches of images. It saves a tremendous amount of time and further simplifies your workflow time and process. It can take some practice to perfect these techniques. You will also have to have Presets already created, but once you get the hang of these techniques, you will be thrilled to have discovered these. It saves you a lot of time in the long run.